There are many vegetables that can tolerate frequent freezing and thawing, and are suitable for you to harvest either through early winter or through the entire winter until spring. These vegetables include salad greens, cooking greens, root crops, and a few others. Most people can choose from among over 20 types of vegetables to harvest during the winter. You can harvest fresh vegetables most of the winter even as far north as Vermont and Maine, although the variety of plants is much more limited in zone 4, where winter temperatures drop below -20 degrees F. You can protect these plants by using unheated cold frames and row covers, although some people choose to use unheated greenhouses – to expand the variety of available winter crops, the number of months they can be harvested, and to enjoy warmer comfort while harvesting their garden on cold winter days. The secret for winter harvests is to grow these vegetables from late summer through early fall, and then “preserve” them in place in cold frames – the cold frames basically act as storage containers for these crops (outdoor refrigerators! ), although some vegetables will continue to grow during warmer winter days, depending on your climate. Many of the greens will start growing vigorously again in early spring before they go to flower, after you have modestly harvested them all winter. I have often harvested wonderful crops of fresh spinach and kale in March and April, before many gardeners even start planting theirs. Arugula – For best flavor, you should only grow this plant during cool weather. It has a distinctive flavor that some people really enjoy. Arugula grows quickly, and overwinters best as young plants. Try planting it over several weeks during the fall, to extend the harvest through the winter. 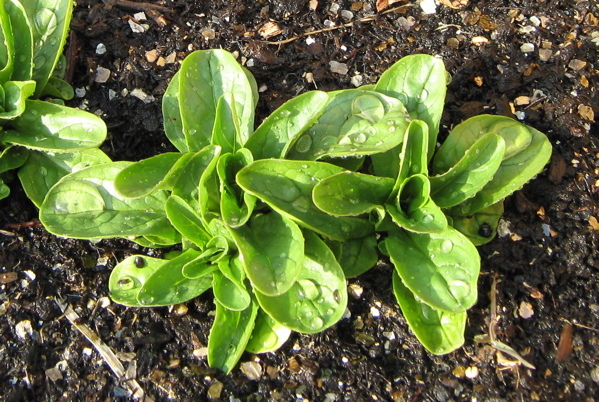 Chicory – Sugarloaf is a tall, romaine lettuce shaped variety of chicory plant. The leaves blanch themselves, and you have a slightly crispy, slightly bitter salad or cooking green. Very easy to grow. The outer leaves may die and turn mushy after severe freezes, but the heart of the plant is usually still tender and great-tasting. Asian Greens – There are many varieties of these greens, most of which are in the mustard family. Some are mild, and some are spicy. I use most of these as cooking greens. Feel free to experiment, and discover which ones are hardiest in your winter garden. Claytonia (Miner’s lettuce) – This plant is native to the West Coast (I saw it growing in the coastal sand dunes of Oregon), and was a popular winter salad green of the gold miners. It is another cut-and-come-again plant, and will keep producing new leaves all winter. The leaves are tender and mild, and you can harvest them even after the plant starts producing flowers in late winter. If you let a few plants go to seed, they will readily self-sow, and germinate again when the weather cools down in the fall. Italian Dandelion – Italian dandelion is really in the chicory family, and the leaves grow upright for easy harvesting. New leaves continue to grow during warm winter days, so this plant is a cut-and-come-again plant. The leaves are a bit bitter, and work well in Italian salads or as a cooked green. Endive & Escarole – Both plants are in the chicory family, and are increasingly common in salads, and sometimes used as braised greens. They have a slightly bitter taste, and grow fairly large. Plant them at least 12 inches apart. Escarole’s leaves are thinner and more tender than endive, with a milder, more delicate taste. Harvesting them in cold weather reduces their bitterness, so you don’t need to hand blanch the plants. Voles are sometimes attracted to their short, thick, and tender stalks (ask me how I know this!). You can harvest just the outer leaves, and let the inner ones continue to develop – or harvest the entire plants. Mache (Corn salad) – This is one of the very hardiest winter vegetables. I have had small plants survive the winter completely unprotected, and size up for eating by March. Or you can harvest protected plants all winter long. This is a very tender, mild salad green, and you should harvest them as small plants by cutting them at the soil line. Don’t expect them to grow very large until they are sending up their flowering stalks. If you let a few plants go to seed, they will self-sow readily, and germinate when the weather cools down in the fall. Mizuna – This plant has mild, delicate leaves with a slight mustard flavor. It’s another cut-and-come-again plant that will survive the winter. Radicchio – There are many varieties of radicchio (another plant in the chicory family), and they often form very beautiful and colorful heads for harvest. Old heirloom varieties can take skill and luck to get them to head up properly, but the newer varieties are much more dependable and easier to grow (the description should say “sure heading”). The heads are often used in salads today, to add color, crispness, and a slightly bitter taste. You should start these plants early enough (but not too early) to fully head up before winter hits. Sorrel – This plant has a lemony-tangy taste that is often used in special soups or sauces, or even salads. It’s a perennial plant, with larger leaves than the wild relative. If you would like suggestions for specific varieties for each winter crop, I recommend The Year-Round Vegetable Gardener: How to Grow Your Own Food 365 Days a Year, No Matter Where You Live and Four-Season Harvest: Organic Vegetables from Your Home Garden All Year Long . However, I don't suggest using the varieties recommended in these books for summer crops if you have warm or hot summers, as I do. These authors live in areas with cool summer weather.